Today is Alyce's brother Luke's birthday. He's now two! The big party is coming Sunday but we had a small celebration too. 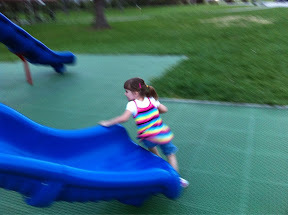 We ate dinner at Culver's, ate ice cream, and played at a park. 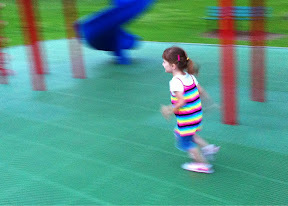 We got to the park kind of late and had the entire playground to ourselves. It was overcast and cool so the slides weren't burning anybody which is a plus. 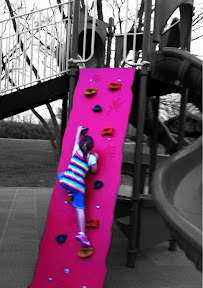 This playground also has a rock wall you can climb that will get you to the level of the slides. Going this route saves lots of time as you don't have to round trip on the stairs. We didn't let Luke get near the wall but we gave Alyce more leeway. The first time she traversed the wall she was halfway up before we got near her to catch her if she fell. Alyce must be part Billy Goat as she went up the wall like we go up a set of stairs. She knew exactly were to position her hands and feet and even skipped a few foot holds on the way up. As I think about how far Luke has grown in the past two years I can see how the next two will have just as big as an effect. 0 comments on "At the Park"